Now you can purchase and listen to the 27 expert interviews featured during the “From Heartache to Your Heart’s Desires” Telesummit as often as you like, at your convenience, and you won’t miss a single gift offered by our experts! There’s nothing more inspiring to us than knowing that your life is about to change and you will soon be experiencing the love your heart desires and deserves! So, listen, pull all of the information shared toward you, and create the life and relationship of your dreams! Congratulations for taking a bold step toward moving past the heartache and moving toward the love your heart desires! Here’s to living a life with all of your heart’s desired fulfilled! Click here to purchase your VIP Interview Series Library. 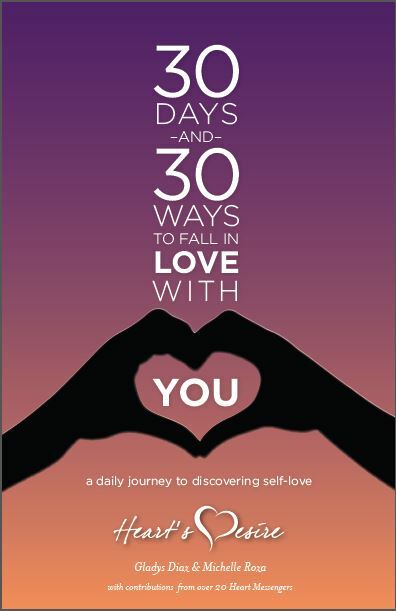 The book 30 Days and 30 Ways to Fall in Love with You: A Daily Journey to Discovering Self-Love is a beautiful and collaborative masterpiece put together by a group of incredible Heart Messengers – experts in their industries and amazing individuals who are committed to transforming this world one person at a time. Make your selections below. The more you buy, the more you save! Dating FUN-damentals: How to Make Dating Exciting, Fulfilling, and Fun! Relationship FUN-damentals: How to Keep Your Relationship Exciting, Fulfilling, & Fun!